I had the pleasure of meeting James Vela while at the Miami Antique Show. It is funny, in this age where so much of our attention is directed online and on social media, to be given an opportunity where you actually meet and interact with those who you love to follow is pretty surreal (for lack of a better term, not yet invented). His posts are creatively executed, usually consisting of a brightly colored feast for the eyes, and I love each and every one of them! It was exciting to meet the real person behind these photos and put a face to a name. If you haven’t already discovered James’ brand Vela NYC on Instagram, here’s your chance! 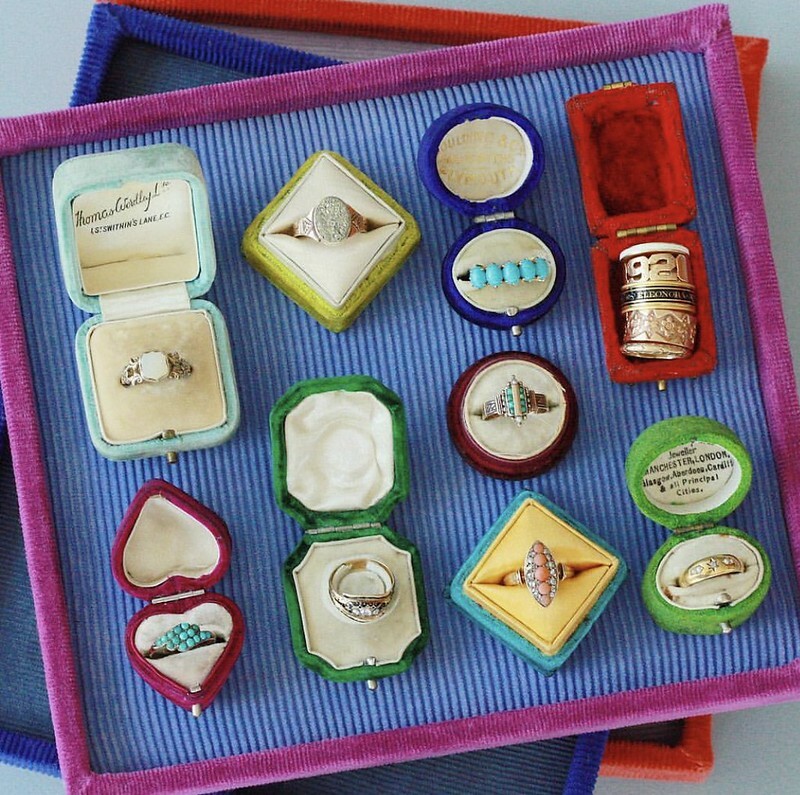 His curation of antique and vintage jewelry is impeccable and his sense of style can’t be taught. It won the attention of his former employers at Lucky, Vogue and Elle. I grew up in a small town in south Texas, so outings to flea markets and antique shops with my family were a frequent occasion. I always had the itch to collect or make use of items from the past. It really wasn’t until my college years when I made it my mission to quit school and move to New York City to pursue a career in fashion. As cliché as it seems, I always had the lingering idea of creating my own business. 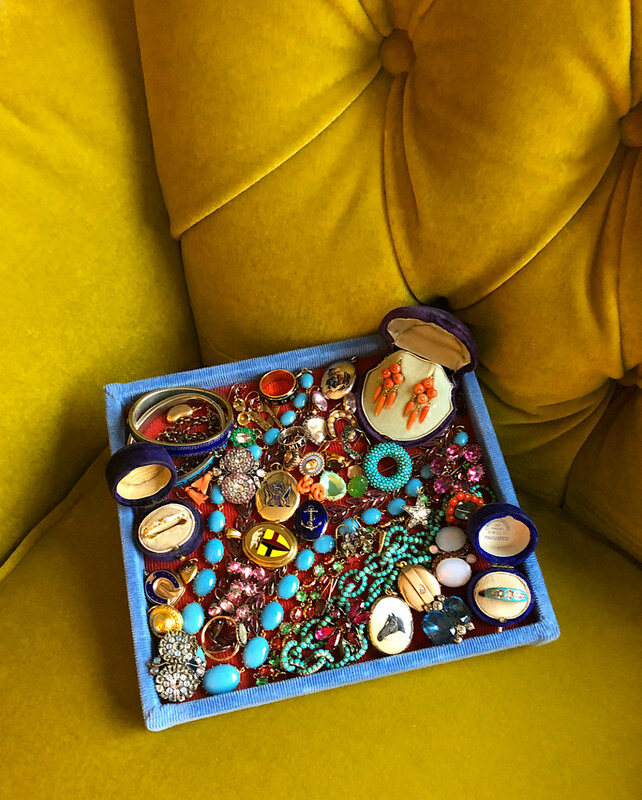 Antique jewelry just made sense to me. I spent my weekends visiting auctions, flea markets and antique shops. I gathered items here and there, made purchases on layaway and started small. After four years of working at several publications including Lucky, Vogue and Elle, I acquired enough pieces and felt confident about launching my own business. My little baby is turning one on April 1st! New York City has many resources, so I usually start here. I’ll take a trip to Brimfield occasionally, but there’s nothing like an air-conditioned convention center filled with antiques–the Miami and Las Vegas shows are a must for me! I recently started traveling to London, which is so much fun. I’m on the hunt anywhere I go. Vela launched a little less than a year ago, but had been a long time coming. Initially, I was fascinated by the fact that pieces of jewelry made long ago were still so relevant. The items I curate span the Georgian era to vintage, so I think it was important to develop a vibe that was recognizable, especially on social media. 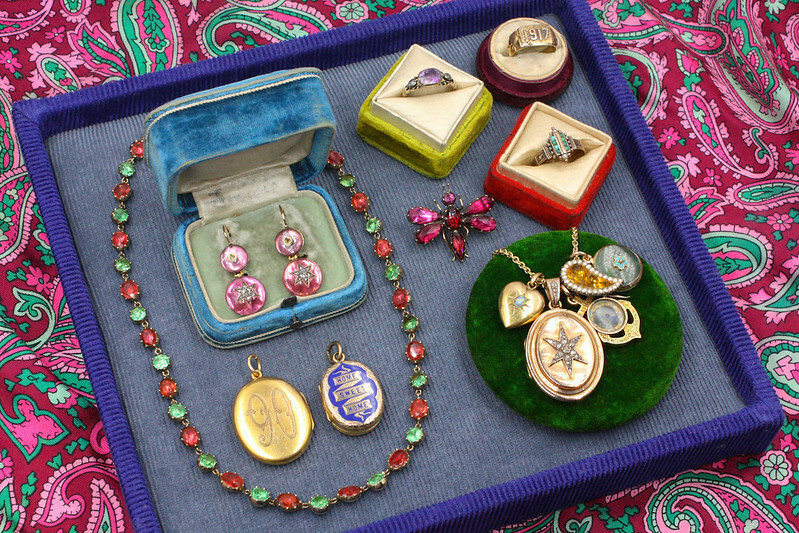 Antique jewelry should be cherished, but still enjoyed when worn and eventually passed down. 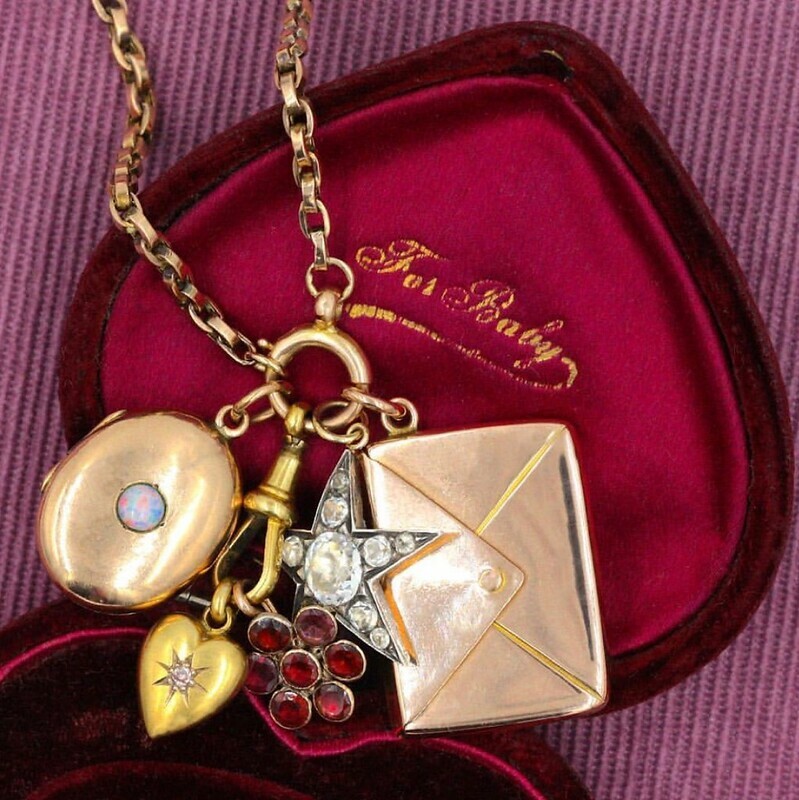 Whether it’s a ring from the Georgian era or a vintage locket, each piece holds a piece of history and deep sentiment. The whole idea is to keep the cycle going. I don’t necessarily have any exciting stories in terms of acquiring a piece of jewelry, but I definitely love the entire experience. The thrill of the hunt and that moment when you find a piece that makes you giddy inside never gets old! Sourcing from seasoned vendors is always a treat. 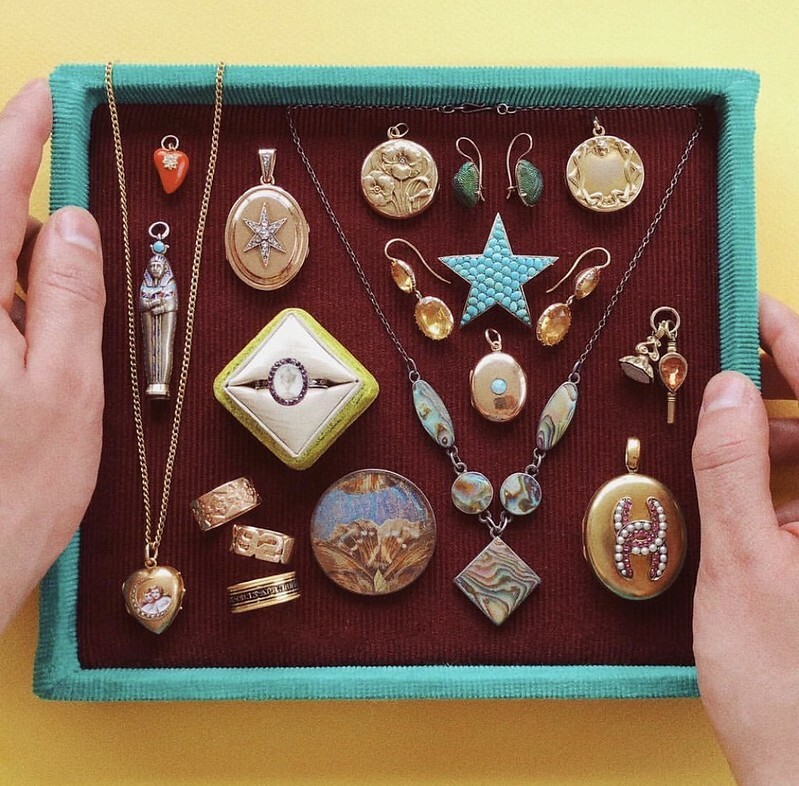 I’ve been lucky enough to meet some pretty amazing mentors throughout my time gathering and selling jewelry who I can count on and ask questions. I’ve also made some great friends, which at the end of the day is the cherry on top. One of my favorite genres of antique jewelry is pavé turquoise. 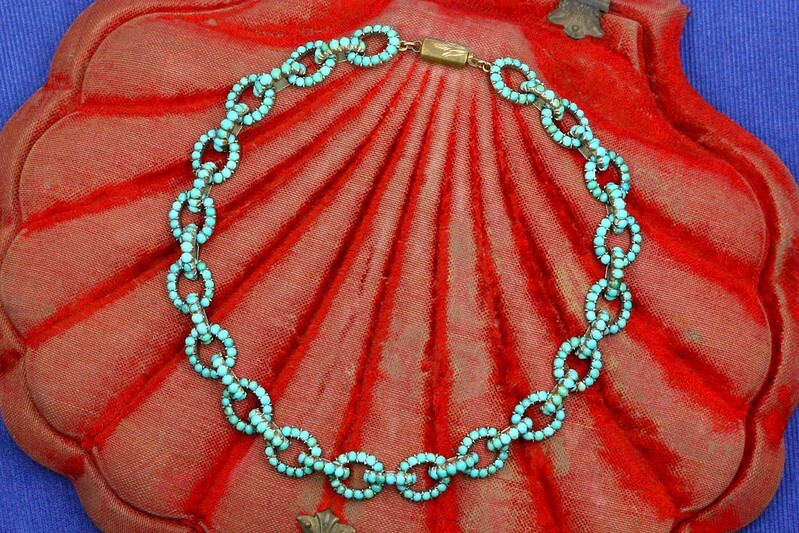 I was shopping in London and came across a stunning chain link pavé turquoise necklace. It seemed like such a modern design and yet so quintessentially Victorian. My heart skipped a beat when I laid eyes on that beauty; it was love at first sight! I only had it for a couple of days before it was off to a new owner. 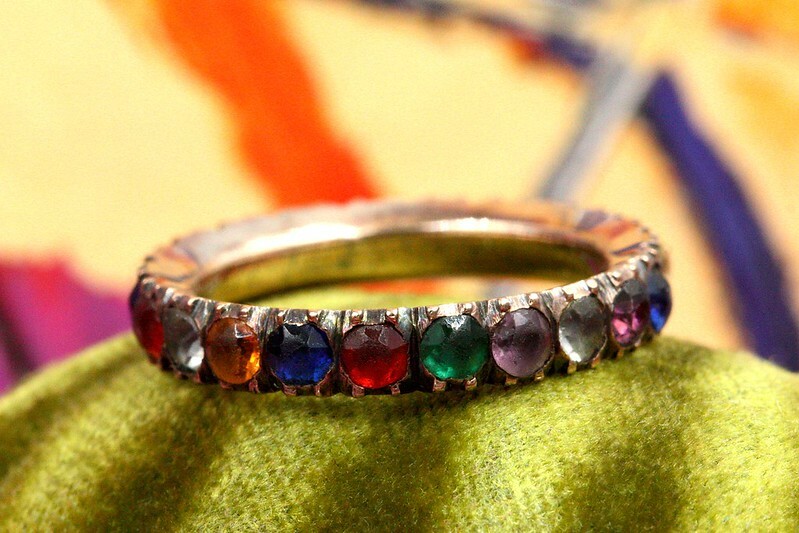 My all-time favorite piece of jewelry was just purchased at this year’s Original Miami Beach Antique Show a couple of weeks ago: a Georgian harlequin paste eternity band. It’s a piece I thought I’d never get a chance to own and have drooled over whenever I came across versions of one on the internet and in jewelry books for years. It’s hard to imagine letting this little one go.